This 1995 book follows somewhat the same subject matter as D.A. 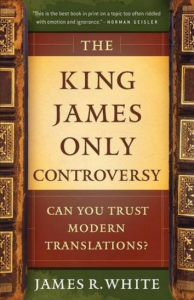 Carson’s 1979 book The King James Version Debate. Though, I think, Carson’s was more original and in a more scholarly tone, White has served the Christian public well by updating and putting this subject into a very readable form. White answers familiar critics such as Riplinger, Ruckman, D.A. Waite and E.F Hills. It is not an anti-KJV book but one that seeks to place the KJV on the same textual and translational playing-field as any other honest version. We need to be reminded more often that choices of words in translation as well as choices of texts differ primarily because honest men are trying to be faithful to God’s revelation and not because of fanciful conspiracies.